360 feedback is a powerful way of improving individuals’ performance and aligning behaviours within an organisation. 360 feedback concentrates on business skills, or soft skills, rather than technical skills. Technical skills tend to have in-built feedback mechanisms – processes either work or they don’t. Gaining feedback on business skills is much more challenging; it has to be sought from others as it tends not to be volunteered. 360 feedback needs to be managed with care and sensitivity. For some it is a welcome opportunity for self-improvement while for others it may cause unnecessary worry and anxiety. Selection of the correct instrument is key to success and should take account of objectives, level of seniority and other organisational initiatives. 360 feedback differs from a performance review in that it is confidential to the individual and is facilitated by an experienced and trusted person who is often external to the organisation. Having carefully introduced and explained the rationale for 360 feedback, the process is straightforward. Raters are identified (see below for more on this) so that online questionnaires can be issued and completed. Confidential one-to-one feedback is provided, usually over two sessions, to permit time for reflection. 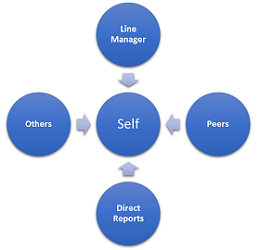 The aim of the 360 feedback is to inform the preparation of a personal development plan. The selection of raters is key to success. It is important that a balance is achieved in the selection of raters and that the process is not devalued by becoming a “find a friend” exercise. Individuals’ responses cannot be indiviually identified, which is why there is a requirement for at least three participants in each group of respondents. The exception to this rule is the line manager, who would be requested to approve disclosure of his or her feedback. It is not necessary to include participants from all of the categories shown in the diagram. Which 360 should I use? The selection of 360 depends on the objectives and level of seniority. We have access to a range of 360s suitable for leadership, management or individual development. Accreditation by the British Psychological Society to purchase, administer and interpret personality and ability tests provides tremendous flexibility. It means that we are able to select the most appropriate test from a wide range of providers including SHL, OPP and Human Synergistics.